10 tracks: Les Barricades Mysterieuses * Allemande * Spanish Dance * Goldberg * Gnossienne #1 * Prelude * Nigra Sum * Pange Lingua * Chaconne * Les Barricades Mysterieuses (baritone guitar). 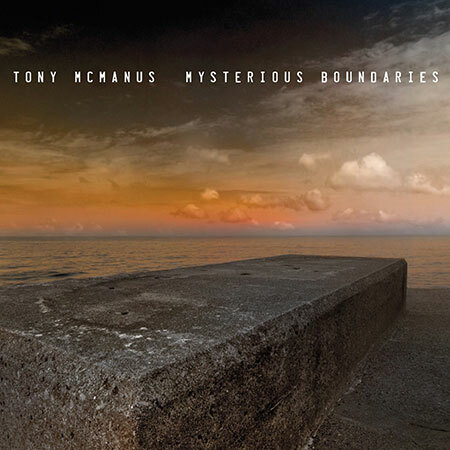 The extremely talented Tony McManus is now regarded as one of the foremost guitarists of the traditional / contemporary / Celtic / Americana music scenes, and regularly gigs and tours with some of the heavyweights in these musical genres from North America and elsewhere. Tony has now added another genre to his diverse repertoire and recorded an album more associated with the world of classical music. This is Tony in his element, as ever, and the CD will add a legion of new fans to his already massive following. In little over ten years Tony McManus has come to be regarded throughout the world as the leading guitarist in Celtic music. From early childhood his twin obsessions of traditional music and acoustic guitar have worked together to produce a startlingly original approach to the ancient art. In Tony’s hands the complex ornamentation normally associated with fiddles and pipes are accurately transferred to guitar in a way that preserves the integrity and emotional impact of the music. In a relatively short time Tony’s music has come to define a new role in Celtic Music. He has come to represent Celtic Music in the guitar world, making regular appearances at guitar specific events where just a few years ago jigs and reels would be unheard of. He is now annually invited to the Chet Atkins Festival in Nashville, and has appeared at guitar festivals in: Soave and Pescantina, Italy; Frankston, Australia; Issoudun, France; Kirkmichael, Scotland; Bath and Kent, England; Bochum and Osnabruck, Germany; and has taught at five of Steve Kaufman’s Acoustic Kamps in Maryville, Tennessee. He recently appeared at the famous Ryman Auditorium in Nashville in the All Star Guitar Night, featuring Steve Morse. Bryan Sutton, Muriel Anderson, Béla Fleck and Victor Wooten - and headlined with the legendary Les Paul. And that’s just a taster! Today Tony’s live work ranges from intimate solo performance through to various duos such as Alain Genty, Bruce Molsky and Alasdair Fraser to the quartet Men Of Steel. He is an enthusiastic collaborator both as a leader and as a sideman having worked with, among many others, Phil Cunningham, Mairi MacInnes, Liam O’Flynn, Alison Brown, Natalie MacMaster, Xosé Manuel Budiño and Andy Irvine. He is also in great demand as a studio musician having contributed to over sixty albums, and in recent years has also turned his hand to record production. Greentrax is proud to be associated with Tony on this his sixth album for the label. Both enjoy the mutual loyalty and respect of a long relationship. After hearing Mike Marshall’s ‘Bach E major Prelude’ played on mandolin, as if it were written for the instrument, Tony began a journey that has challenged him to engage with music he had long appreciated but never considered before. There were many hurdles to jump along the way and not being a classical musician, Tony’s route over them would not be the conventional one. His hope is that whatever the path, the destination - the emotional content of the music – is the same. Of this album of classical pieces, Tony says that maybe the boundaries between the genres are more porous than might first be apparent. You be the judge of that but we think this is just brilliant music.